Remember a band called The Rembrants? If not, don’t feel bad. The Rembrants were pretty much just a one hit wonder from the 1990’s. Their only hit song was “I’ll Be There For You” (aka the Friends TV show theme song). Well, if you happen to be a fan of the classic cartoon Thundercats (1985), you might suffer a slight Rembrants flashback. 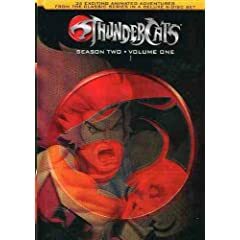 Part of the DVD extras for Thundercats – Season Two, Vol. 1 is music video of the Thundercats theme song sung by The Rembrants. In case you are curious, here’s a behind the scenes promotional video of the music video I found on Vmix. Where’s Mumm-Ra when you need him?